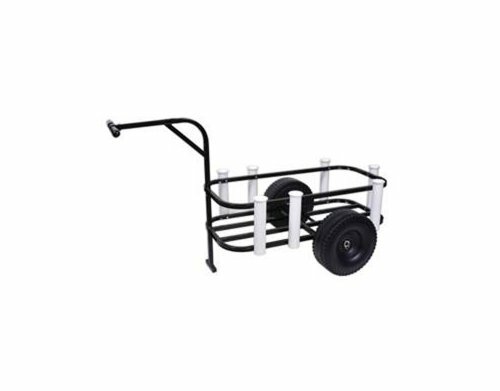 A beach cart is a helpful utility trolley that can prove useful for carrying all kinds of goods. Most people use them for taking umbrellas, cooler bags, and chairs to the beach, but they are also ideal for camping, festivals, and other occasions. A cart typically consists of a steel or aluminum frame, polyester 600-denier fabric, and other accessories like cup holders and comfortable pull handles. Some have different wheels to be more suitable for challenging terrain too. The goal is to identify what you would use one for, set your budget, then consider the quality and convenience of every valid option on the market. Then, once you buy a cart to suit, you can pack all your goodies, grab your family and friends, then head away on a fun adventure where everyone can have a swell time. Journeying to the beach can involve carrying a lot of stuff, but if you invest in this beach cart from BeachMall, you can leave your hands free. This cart is an excellent example of what’s available on the market. It features a robust spun polyester construction, contemporary black and gray color scheme, and plenty of storage space for all your beach goodies. You can even carry up to four beach chairs in it with room to spare! There is a lot to love about this beach cart. It can hold up to 75 pounds of weight, has wheels you can remove for flat storage, and comes with a table and cup holders too. Even the frame is something to appreciate, as it has powder coated steel to protect it from rust. However, the durability of the framework is questionable due to some rust forming and rivets popping out anyway. The price tag, too, might be a little high given its misgivings in quality, but the portability and ease of use can see this beach cart near the top of your must-have list for summer. This beach cart from BeachMall is the ultimate must-have item for any outdoor event, concert, or trip to the beach. It has enough room for four beach chairs, the bodyboard, and even an umbrella. In essence, it will keep your hands free and do all the hard work for you. 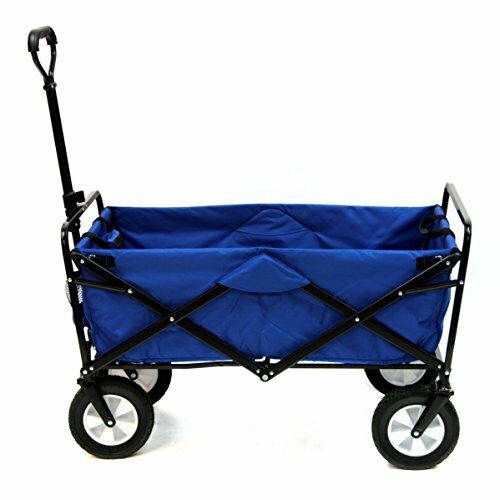 This beach cart is also more manageable than several others on the market. It has wide wheels to help it navigate challenging terrain, and these also pivot and snap on. You can remove them to fold the beach cart flat for storage. If there’s anything to complain about, it would be the ability of the wheels to handle deep sand. You are going to have more luck on hard sand or keeping it off the sand altogether. However, it’s still going to be a standout addition to the boot of your car. You can load almost anything into it so you don’t have to have every member of your family loading up their arms. If you’ve got a lot of gear to carry, but not enough hands, then it might be time to invest in this beach cart from Rio Gear. As one of the best on the market, it’s a versatile option for those who want to take a lot of comfort items to the beach or an event for a full day of fun. You can choose from three patterns – all in blue – then enjoy how compact and portable it is. When you’re not using it, you can then fold it down and store it away in a closet. 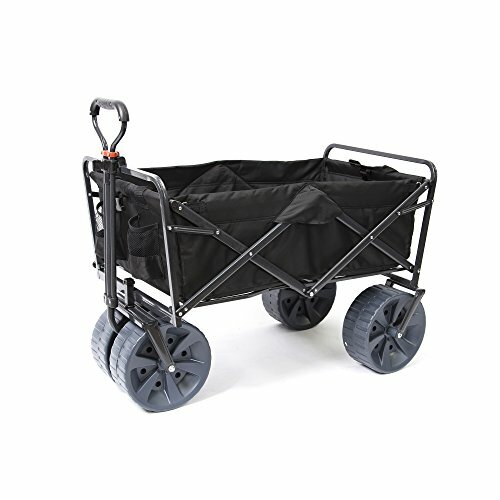 Once you unfold it, however, it then becomes a generously-sized beach cart that can hold 15 cubic feet of storage space, set upon four articulating all-terrain wheels. You will love everything this beach cart has to offer. The stroller-style handles feature neoprene for comfort, while there’s even a holder for your umbrella so you don’t have to carry it. This beach cart also comes equipped with a bottom tray, rack, and removable tote bag you can clean. If there’s anything you wouldn’t enjoy about this beach cart, it’s that the wheels are noisy. The cart also makes a lot of noise when it’s moving, and it’s not suitable for loose sand. If you know you won’t be coming across loose sand, and you don’t mind spending more than you would on another beach cart, then there are many reasons to consider this cart from Equip. Even though it’s not a contender for sand, it’s an excellent option for attending events, going to the beach, or taking everything you need to a festival. 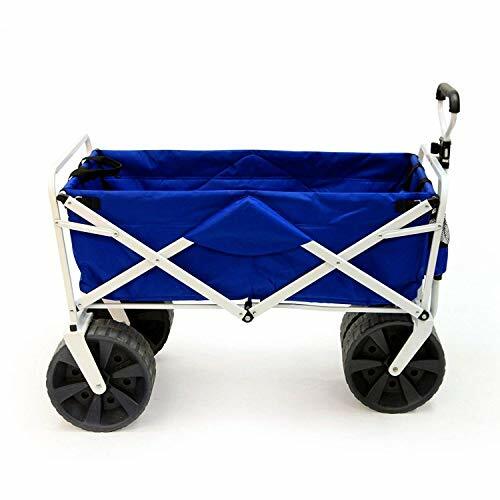 This beach cart has a robust steel frame that collapses down, strong rip-free polyester fabric, and plenty of features to help it last as long as possible. As a result, you can pile in 220 pounds of items and have it handle the pressure well. It also has free-moving front wheels so it can handle cornering better, and you can put the handle into various positions to manage hard and soft terrain. There’s very little this cart can’t handle. What’s more, if you lack space at home, you can quickly fold this cart up in seconds until you require it at a later date. While there’s no denying it costs more than others, it’s an excellent investment once you see all it can do. If you’re looking for a beach cart that offers everything you need for a successful beach trip, then check out this model from Rio Gear. Even though it has a few durability issues the manufacturer might want to address, the consensus is that it’s a well made and convenient product to take to the beach. It’s capable of holding six chairs and a 48-quart cooler, and also has a utility tray at the top of it which can hold cups, phones, tablets, and more. If you’ve brought your lunch along, you will also enjoy the convenience of the mesh storage pouch and insulated cooler bag. There is even an umbrella holder so you can enjoy your meal in the shade. Many beach carts struggle with terrain, but this one is a game changer. With 10-inch pneumatic tires featuring rubber tread, it’s more capable than other beach carts of handling sand – even though it may not travel well on loose sand. Load this cart up with 100 pounds of goods and set off on an outdoor adventure with friends and family. Some of the features of this beach cart will not impress those who take it at face value, but if you buy it and use it, you will start to appreciate many of its good points. It’s not the most durable cart, nor is its wheels all that impressive, but these are minor points in the scheme of things. 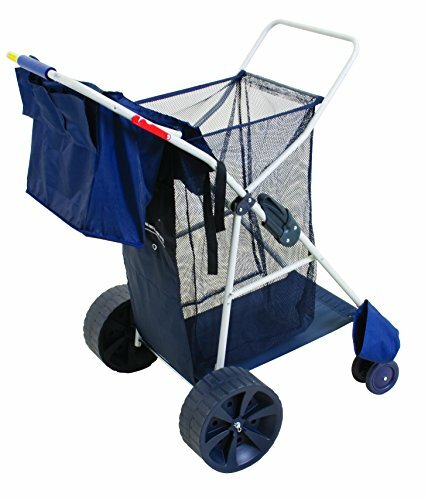 The polyester fabric ensure it’s durable to hold up to 75 pounds of items, while the space available inside the cart bag is impressive too. You can fit up to four chairs and a 32-quart cooler bag. 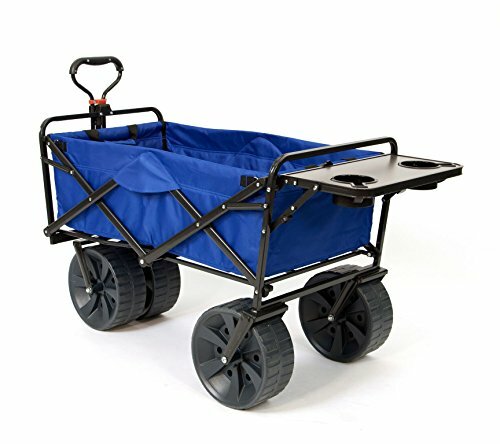 You can also use this beach cart for laundry, carting wood, and more. The sky’s the limit for its capabilities. If you don’t have much space to store such a thing in your home, then you will even be pleased to know it folds down. Even though it holds such a lot of items, its flat size is nothing your closet won’t be able to handle. 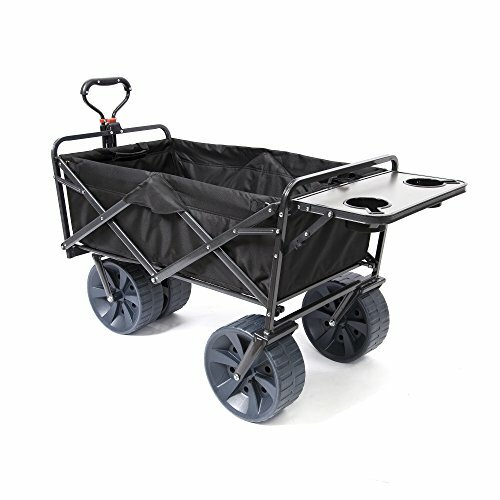 When the time comes to invest in something for carting goods, let this beach cart from Rio Gear be a contender. If you’re worried about durability when it comes to a beach cart, then it might be time to check out this unit from Timber Ridge. Designed for camping and outdoor adventures, it’s one that’s going to stand the test of time. This beach cart is also one that won’t disappoint when it comes to convenience too. You push a button to open it right up, and there is also no assembly necessary. Once you fold it down, it fits into a handy carry bag. This beach cart can hold up to 150 pounds of goods, or 110 pounds in the sand. However, even though it has rugged eight-inch wheels and an extra wheel for sand travel, it’s still not the best for making its way through soft sand. There is plenty of room for all your goods in this beach cart, and the handle allows you to trundle it along at an expert pace. 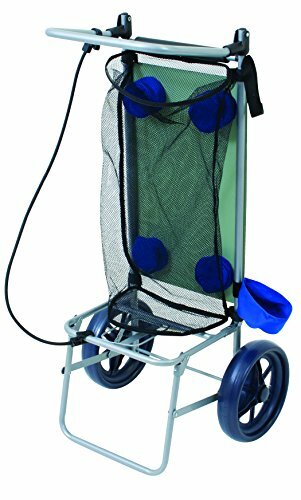 When you need a reliable beach cart for camping and carrying, this is an excellent option. Going out for the day with children is a hard task, but it’s one that’s entirely possible if you have a beach cart. This model from Radio Flyer is all about making sure any outing with family is going to be a convenient one. Pop your children in the wagon along with your beach chairs and enjoy the convenience such a setup has to offer. 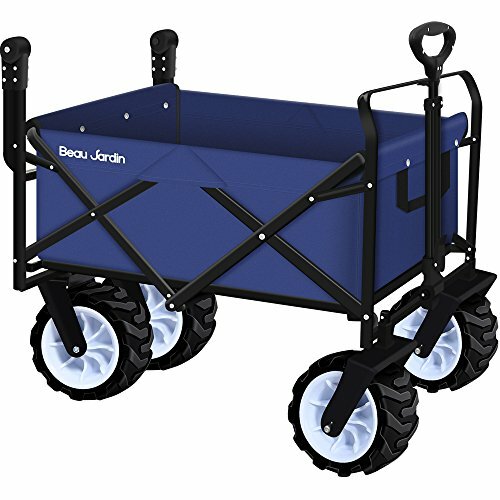 This beach cart comes in five styles and colors, but is also foldable and has a three-in-one layout. As a result, you can ride in it, use it for hauling, or take advantage of the bench seat within. For safety, there are also seatbelts in most (but not all) models. Where many beach carts struggle to handle varying terrain, this one powers through. It features real rubber off-road tires to ensure it’s well-equipped for tricky terrain. While nothing will handle loose sand with all that much efficacy, this beach cart gives it a good go. It won’t even be too uncomfortable for the kids sitting within. If you’re worried about all that weight sitting in there, then don’t be. Thanks to the high-quality material, robust frame, and comfortable pushing power, it can handle up to 150 pounds of weight with no problems at all. Sealing the deal is the surprisingly affordable price tag. Even though this beach cart is the epitome of quality, packed full of features for your family’s convenience, it’s still not out of the question. It will most likely exceed your expectations. If money doesn’t matter as much to you as style and convenience, then you may see the value in purchasing this beach cart from Glampin’ Life. When it comes to a cart that lasts a long time, it doesn’t get much better than this one. There is a lot to love about this cart. It has 13-inch balloon wheels to stop it digging into the sand, and it can hold up to six chairs as well. It also features marine-grade aluminum framing and hardware that won’t rust or degrade while at the beach. Even the blue color scheme is a nice touch and break away from other beach carts on the market. However, with all the benefits, there are also a few reasons why you wouldn’t buy this cart. Firstly, it’s exceptionally expensive – even costing as much as four times more than other carts on the market. Then, it has room for four umbrellas, but who needs four? The manufacturers would be better off adding internal features to the cart to make it more user-friendly, as opposed to catering for the one person in a million who may carry four umbrellas to the beach. This beach cart has potential, but it’s not there yet. There is still a lot of work to do before it becomes worth its exorbitant price tag. Whenever the warmer weather hits, families and friends love to get together and enjoy outdoor events. Trips to the beach, camping, and festivals all become part of summer fun. That’s why a beach cart can be such an important addition. It helps you to carry all your items so most family members and friends can keep their hands free. However, not every beach cart is going to be suitable for your needs – especially as there are so many varieties from which to choose. Below, you can take note of some of several considerations for choosing the best beach cart for your needs. Before you buy a beach cart, you need to think about the purpose of it. Do you need it for festivals, camping, or trips to the beach? Some are better equipped to handle one purpose or the other. For example, a beach cart that’s going to work well at the beach is one with balloon-style wheels. What’s more, if you are heading to the beach, you may like a cart that has an area for a cooler, umbrellas, a bodyboard, and your beach chairs. Some beach carts are custom-made for this purpose. Choose wisely. Every beach cart is different – even when it comes to sizing. The first thing you need to do is consider what you are putting in it, then get the tape measure out. Most manufacturers supply measurements, so you can find out whether it’s going to be too big, too small, or perfect for your items. Regarding size, too, you may also like to know whether the one you’re looking at folds down for storage. Otherwise, you will need somewhere with plenty of space to store it! Unfortunately, not every manufacturer creates their beach cart to be one of quality. Therefore, you need to work extra hard to find one that ticks all the boxes for handling daily use. Pay attention to the frame strength, in particular. Powder coating, steel, or aluminum would all be valid options. Then, make sure the polyester for your cart won’t rip and will handle a lot of use. The price tag for a beach cart can vary quite dramatically – with some up to four times as expensive as others. Set a budget then narrow down the options that fit into it.